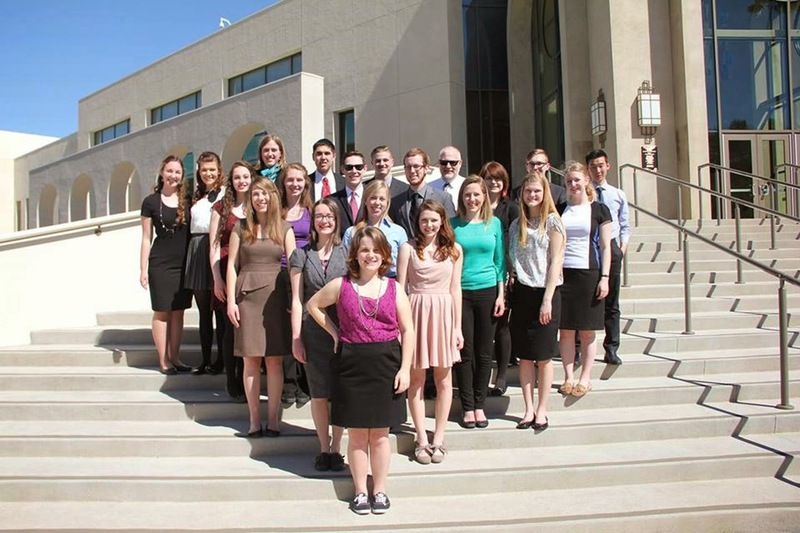 The Whitworth University forensics team took first place at the National Christian College Forensics Association (NCFFA) National Tournament for the second year in a row. The tournament was hosted by California Baptist University March 8-10, and featured 28 Christian higher education institutions from 15 states. Whitworth took second in the speech sweepstakes, third in the debate sweepstakes, but first in the overall sweepstakes, ahead of schools including Azusa Pacific University, Biola University, Colorado Christian University, Dordt College, Liberty University and Wheaton College. The Whitworth forensics team, coached by Professor of Communications and Director of Forensics Mike Ingram, brought home 23 individual speech awards and 12 individual debate awards. Three team members were named national speech champions and five were named national debate champions. Sarah Sauter, ’15, won impromptu speaking and communication analysis, and Liz Jacobs, ’17, won the novice division of extemporaneous speaking. Ingram describes forensics as a valuable co-curricular opportunity for students, because it blends critical thinking, writing, research, speaking and leadership training that they will use throughout their lives. Students work alone, in pairs and on teams to accomplish set goals, and they encourage each other to develop new foundations of knowledge and skills as they compete. Alex Hoffmann ‘16, Jonathan Kim, ’15, and Stephanie Saracco, '15, each won gold medals as co-national champions. Evan Barnes, ’16, and Hannah Tweet, ’16, won silver medals. Chris Burnett, ’16, Lilly Davis, ’16, Sam Director, ’15, and Bri Miller, ’15, won bronze medals. In the novice debate division, co-national champions include Ellie Probus, ’16, and Liz Jacobs ’17 while Rebecca Korf, ’15, won a silver medal. Norann Beidas, ’16, took 5th place in after-dinner and was a semifinalist in extemporaneous. Sam Director, ’15, took 2nd place in informative and 5th in impromptu, and was a semifinalist in extemporaneous. Krista Eades, ’15, took 5th in novice dramatic interpretation. Alex Hoffmann was a semifinalist in impromptu. Andie Ingram, ’15, took 3rd in persuasion. Liz Jacobs, ’17, won novice extemporaneous and was a semifinalist in novice impromptu. Jonathan Kim, ’15, took 3rd in communication analysis. Addy Koneval, ’16, took 4th in programmed interpretation. Rebecca Korf, ’15, took 3rd in novice after-dinner and 3rd in novice informative. Ellie Probus, ’16, took 5th in novice prose and 5th in novice informative. Sarah Sauter, ’15, won impromptu, won communication analysis, and was 2nd in persuasion. Stephanie Saracco, ’15, took 3rd in programmed interpretation and 5th in poetry, and was a semifinalist in extemporaneous. Hannah Tweet, ’16, was a semifinalist in extemporaneous. On April 2, Whitworth will host the national debate champions of Ireland in an international debate exhibition at 7 p.m. in Weyerhaeuser Hall’s Robinson Teaching Theatre. Whitworth will speak in favor of the motion “America is a friend to the world.” The team’s final tournament of the season will take place April 10-12 at the International Public Debate Association National Tournament, held at Middle Tennessee State University in Murfreesboro, Tenn.